Paleoanthropologist, Dr. Tim White has made significant discoveries of early hominids -- the group of species that includes humans, their direct ancestors and close relatives. He is a professor of integrative biology and co-director of the Laboratory for Human Evolutionary Studies at the University of California, Berkeley. He also is curator of biological anthropology for the Phoebe A. Hearst Museum of Anthropology and a research paleoanthropologist at the Museum of Vertebrate Zoology at Berkeley. White led a team of researchers that discovered a hominid fossil dating back 4.4 million years, among the oldest human ancestors yet identified. Fellow of the California Academy of Sciences, fellow of the American Association for the Advancement of Science, David S. Ingalls Jr. Award from the Cleveland Museum of Natural History, a member of the National Academy of Sciences and the Distinguished Alumnus of the Year (2000) at the University of California, Riverside. What did our earliest ancestors look like? 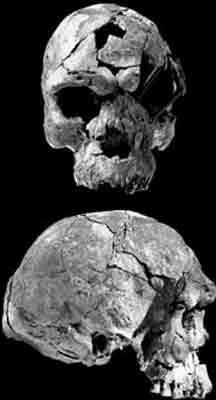 Tim White's discoveries in Ethiopia are filling the gaps in the human family tree. As a boy growing up in Lake Arrowhead, California, in the 1950s, Tim White used to collect obsidian flakes and pottery shards at ancient Indian campsites in the nearby San Bernardino Mountains. (He also amassed a menagerie of lizards and snakes, much to his mother's dismay.) Told by a high school guidance counselor that his dream of studying dinosaurs was unacceptable, White headed to the University of California, Riverside, to major in biology  and eventually anthropology as well. He spent his weekends catching rattlesnakes. But he never lost his childhood fascination with prehistory, and today he is one of the world's leading collectors and interpreters of hominid fossils in the grand tradition of the Leakey family, with whom he has cooperated and competed over several decades. Since 1981 he has co-directed a research project in Ethiopia that has pushed back the story of human evolution more than 2 million years, to the moment in prehistory when humans separated from the chimpanzees, our closest kin. 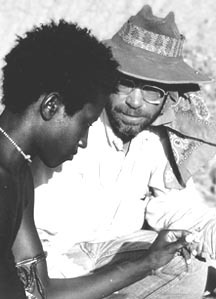 White was working on his Ph.D. in physical anthropology at the University of Michigan in 1974 when he landed a plum summer job doing fieldwork with Richard Leakey's team at Koobi Fora, Kenya. He spent three seasons there and so impressed his boss that when Mary Leakey needed someone to describe the hominid fossils she had found at Laetoli, Tanzania, her son recommended White. 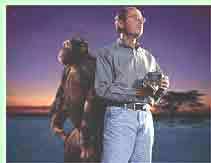 Later, White helped excavate Laetoli's famous trails of hominid footprints. By age 28, White was ready to redraw the human family tree. He had just joined the faculty at the University of California, Berkeley, where he remains today, and was collaborating with Donald Johanson, the discoverer of the Lucy skeleton. Together they proposed a controversial  but now widely accepted  restructuring of our evolutionary heritage, based on a recently discovered species that the two scientists had named and described. In the early 1990s, White and his colleagues found what was then the oldest known human ancestor, 4.4 million-year-old Ardipithecus ramidus; its bones and teeth provided the first hint that humans began to walk upright in forests, not on the savannah, as most experts believed. Several years later, White and his team unearthed yet another creature, 2.5 million-year-old Australopithecus garhi, which filled a crucial gap in the human lineage and was associated with the earliest evidence of butchering animals. Meticulous and skeptical to a fault, White often takes years to analyze and publish the results of his fieldwork. (He is still piecing together a ramidus skeleton that was discovered in 1995.) "He's the most exacting person I've ever met," says Kent State anthropologist C. Owen Lovejoy with a sigh. "But that's what has made him so successful. He finds stuff that no one else can find and trains students in ways that no one else does. His energy and devotion are limitless, 24 hours a day." Ultimately, White says, he would like to be remembered not so much for his discoveries as for the way he made them. "One of the things I'm most proud of is the high-level involvement of Africans in our project because they will carry the knowledge to the next generation," he explains. "I consider these resources  fossils and fossil sites  to be really endangered. They are fragile erosional systems, and the fact is, you get only one shot to do this right. When you work at a site, you alter it forever."